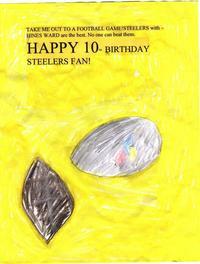 My 7 year old son made this precious card for my 10 year old's birthday - It was such a sweet moment watching him play with the font, color the Steeler's emblem just right and go through 3 yellow markers to color the entire background yellow "Cause the Steeler's colors are black like the letters and yellow like the background"
But, there is a problem - I am still only scrapbooking the end of 2004! - I am not ready to put those treasures in their eternal place of album pages. So, what to do? Easy! I have 12 folders, each marked with a month and the year. I keep them right in the Blessing Room in my house for easy access. And, when I find that receipt, precious note, or special doodled picture - I write the important info on a sticky note, put it on the back of the paper, and, place it in the appropriate month's folder. Then, when I finally get to that month or time of year, I have the papers dated, and the moment's special memory written down. What are some things you may want to jot down about the paper? What papers could be saved? So, find 12 folders, while you watch TV next time, date each folder for the entire year and put them in an easily reached area. Put a pile of sticky notes in a central place or close within reach as well. I promise you that you will find yourself saving more of those 'special moment papers', and, you will be loving yourself when you do finally have the opportunity to preserve them, that you had taken the extra minute to write why in the world you saved this!